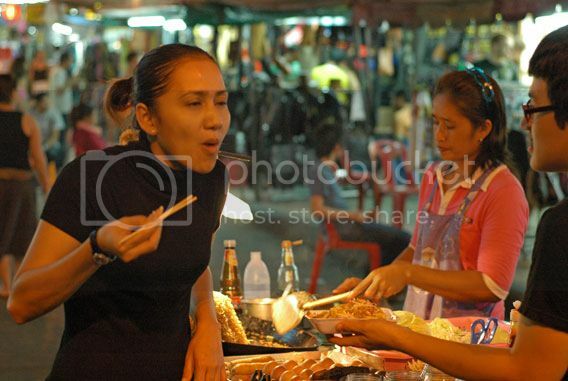 Thailand is certainly one of the most popular tourist destinations in southeast Asia, which isn't surprising since Thailand has amazing culture, tasty cuisine and gorgeous beaches. 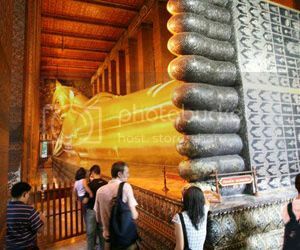 Wat Pho (a.k.a the Temple of the Reclining Buddha) is without a shadow of a doubt, the most visited of all temples in Thailand. Wat Pho is located in Bangkok (right next to the Grand Palace complex) and it’s a truly impressive sight to behold. The surrounding complex alone is jaw-dropping, while the sheer size of the Reclining Buddha with her breathtaking “inlaid mother-of-pearl feet” will make you feel like an ant! Wat Pho complex also boasts hundreds of Buddha images on display, dozens of stupas, chedis, and gorgeous grounds where you can enjoy lovely walks. Another great thing about Wat Pho is that it's home to a school of traditional Thai massage where you can get a real Thai massage without putting a hole in your pocket! Wat Phra Kaew literary translates to “Temple of the Emerald Buddha” and it’s easily one of the most sacred temples in Thailand. 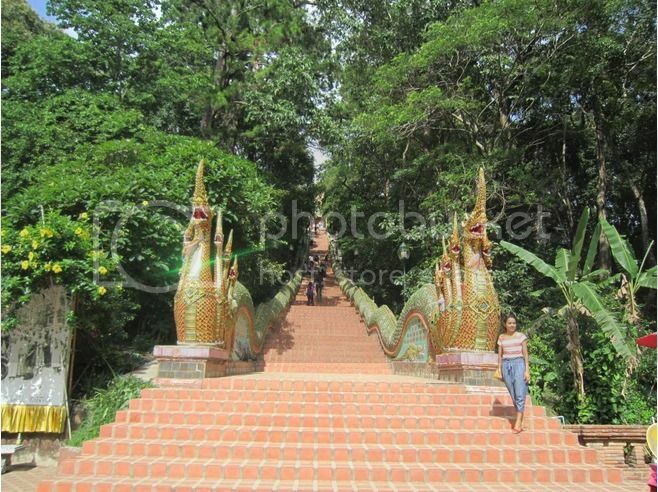 The Emerald Buddha is considered the symbol of Thai culture and Thai Buddhism. Despite its sacred status, Wat Phra Kaew’s Buddha is just about 3 feet tall, though it’s carved out of a single Jade stone and it is truly stunning! Wat Phra Kaew may not be as impressive as Wat Pho but this temple boasts beautiful Thai paintings and typical Thai architecture. 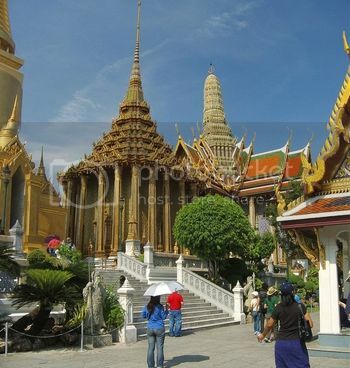 Another reason Wat Phra Kaew is one of the must see temples in Thailand is because its location within the grounds of the Grand Palace, which is easily the biggest tourist attraction in Bangkok. Wat Arun is known as the “Temple of the Dawn” and it’s yet another Buddhist temple in Bangkok that is more than worthy of your time. 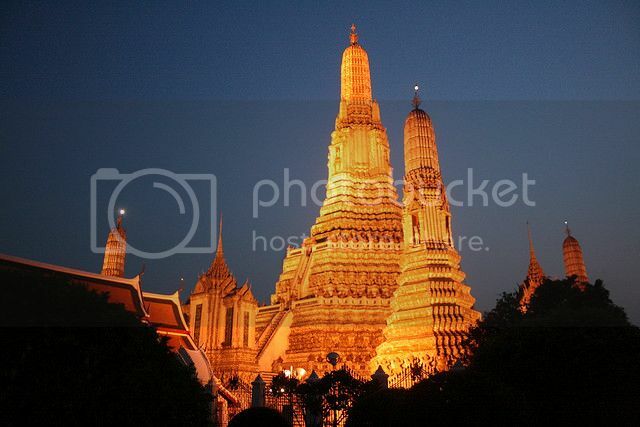 Wat Arun is beautiful and what makes it stand out from the rest is its construction. Unlike the other Thai temples in the country, Wat Arun has a strong mixture of Chinese and Cambodian architectural styles. Another reason for Wat Arun’s popularity is that from its top you can get some of the most gorgeous views over the Chao Phraya River ever! Also, if you visit Wat Arun around 8am or 5pm you’ll be treated to even more dramatic views. The early morning and sunset light reflect off the surface of Wat Arun temple making glow in an array of rainbow like colors. Wat Phrathat is no doubt, one of the must see temples in Thailand as it enjoys one of the most spectacular locations for a Thai temple. Wat Phrathat is located on Doi Suthep Mountain (which is around 7 miles from Chiang Mai) but it’s worth the visit even if you’ve already seen the major temples of Wat Phra Kaew and Wat Pho. The visit to Wat Phrathat offers several highlights such as riding the steepest cable car (Doi Suthep funicular has an inclinaton of more than 40 degrees). Also, on a nice clear day you'll be able to enjoy the most impressive views over the city of Chiang Mai. Wat Traimit boasts the world’s largest gold Buddha statue and it’s without question, one of the must see temples in Thailand. Wat Traimit is known, unsurprisingly as the “Temple of the Golden Buddha” and you’ll find this temple right in the heart of Bangkok’s Chinatown. The Golden Buddha temple is certainly one of the most famous temples in Thailand, while the Buddha statue is nearly 10ft tall and weighs more than 5 tonnes. Definitely worth the visit if you’re in Bangkok! The Golden Mount temple (Wat Saket) is another Thai temple located on a hill that enjoys a great location and offers nice panoramic views. 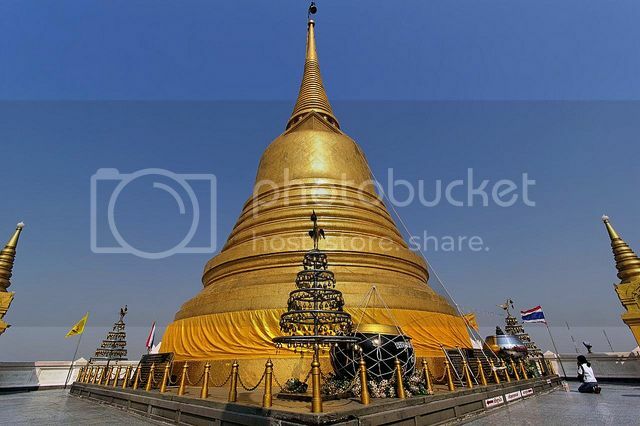 Wat Saket (Golden Temple) is also located in Bangkok and while it may not be as grand as the other temples in Bangkok, Wat Saket sure offers the best views of Bangkok’s city centre. Besides great views of Bangkok, Wat Saket also offers a serene and peaceful atmosphere, which is great if you’re looking for a quite spot to escape the huge crowds of Bangkok’s city centre. The last two temples worth adding on the list of “must see temples in Thailand” are Phuket Big Buddha and Wat Chalong, both of which are located in Phuket province. The Big Buddha temple is located in Chalong, while Wat Chalong is located not far from Phuket town (on the way to Rawai Beach). If you’re visiting Phuket, say, on a day trip from Patong you definitely won’t want to miss visiting either of this places. 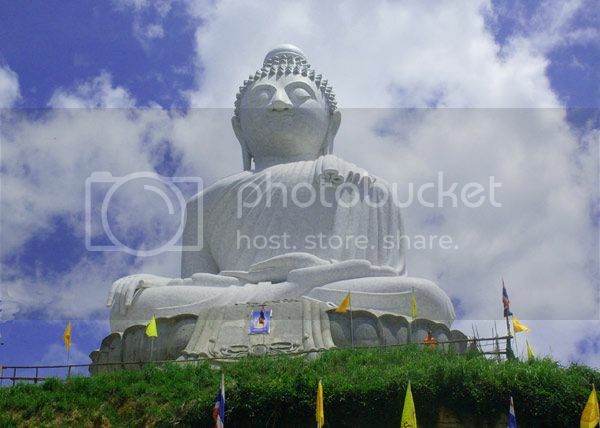 Phuket Big Buddha is particularly amazing because of it’s sheer size (147ft tall) and spectacular location atop the Nakkerd Hill that offers great views of Phuket’s coastline and town. Wat Chalong also offers nice photo opportunities and it’s a great place to visit, especially if you’re looking to meet real Thai Buddhists and learn more about Thai religion and practices. Just like much of Asia, when it comes to visiting religious sites such as temples, shires, etc; there’s a dress etiquette devotees and visitors have to abide by. 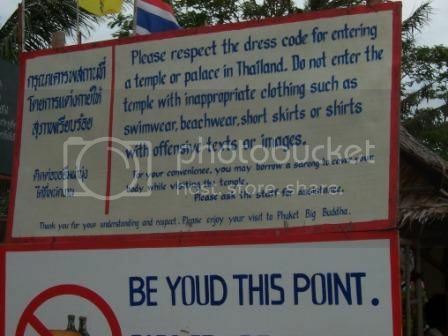 Thailand is very strict regarding the dress code for visiting temples their temples and even tourists (both men and women) are expected to dress appropriately when visiting Thai temples. Things like tank tops, flip-flops, three quarter length trousers, short sleeves, short skirts, and mini-skirts are a definite no no. Basically, you’re not allowed to wear anything that exposes your skin or marks your figure (i.e. tight jeans, tops, etc).